Before we go any further, let me first answer last week’s enigma. Yes, once again I stumped the gallery (a friend of mine on a social network, however, found it, but I couldn’t convince him to post the answer!). 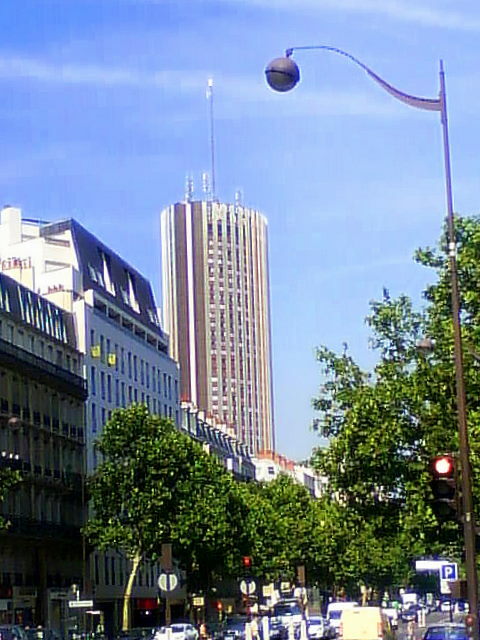 And here’s the answer… The building is the Hôtel Concorde La Fayette, in Paris’ 17th district. That’s two in a row no one has been able to find! Here’s to hoping this week’s is a bit easier. Here we go… Where is this fountain? If you think you know, leave a comment below! Yeah, I was proud of that friend who figured it out. 🙂 I was very pleased with my clue, too. I have no idea where that fountain is. I don’t think I have ever been there… I’m trying to think of where you could have been recently with work — someplace I have not been, and still have no idea. I hope someone can solve it! I found it. Based on a couple of hunches. My initial guess I referred to up there was wrong, but then I got to thinking… The trees are a huge clue. I have not seen this fountain in person, though. Let’s see if I can come up with a clue. and it was summer in the pool. an echo and a return. a garden observed near the avenue. they think, therefore they exist. Not “rhyme-y” but very Da Vinci Code / Treasure Hunt. I like it! Ooh, ooh, ooh, I MIGHT know this one. Is it at the bottom (southern end) of Luxembourg Garden, not too far from the cafe where Hemingway wrote in Montparnasse (Closerie des Lilas) … near the Port Royal metro/RER? It’s the Fontaine des Quatre Parties du Monde in the Marco Polo Garden, exactly where you described it. Congratulations! Here’s your prize… A virtual Chupa Chups Badge! The virtual Chupa-Chups badge is outstanding. Thank you! Seriously, I am thrilled to have known this one. Clive and I did a guidebook walk in Montparnasse late last year, and it ended around this fountain. We caught the RER back to our quartier. I had never realised ‘my’ beloved Luxembourg Gardens had that bit that stretched a bit further south. But I didn’t know the name of the fountain (or had forgotten it). Cheers and definitely hope to see you and your gorgeous partner in the streets sometime soon. Hi Paul .. I am a friend of Carolyns, well not only hers but Leesa, Dawn, Barbara, Brigitte, Kim, Jennifer … I have not met Karin yet but hope to very soon. I came over here via Carolyn’s blog, saw a comment left by you .. so came over . Could not believe this post as I have exactly the same photo .. I had walked from Place Denfert Rochereau to Jardin de Luxembourg .. passed this place .. and Carolyn got in the answer before me 🙂 I was going to say in the jardin des grands explorateurs…. ! Thanks so much for stopping by! Karin and I had a coffee with Leesa and Dawn (and others) the other day at the Malongo in the 6th. 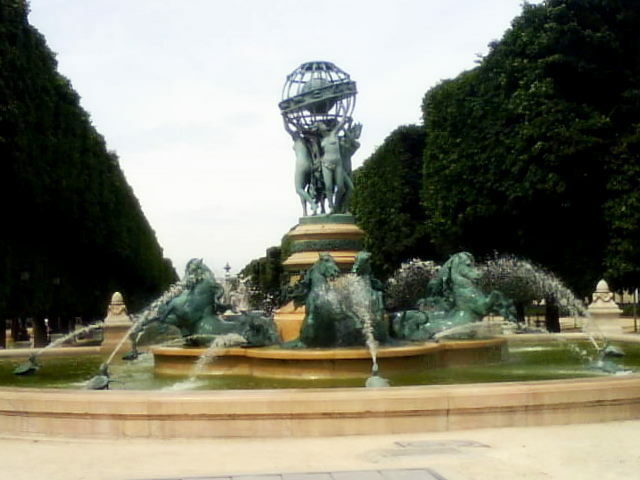 I’m sure your photo of the fountain is better than mine, but that’s the idea behind “Paris by Cell Phone”! Come back again soon, and next Wednesday you can try for the coveted Chupa Chups badge!